Limited quantity of 600 Available! Feeling Lucky? We're hosting a giveaway for a free kit here. We are organizing this group buy to give people access to our initial shipment of kits at a significant discount. We will also be sending a series of example projects to members of this group buy with detailed tutorials. The Bread Proximity module measures the Line-of-Sight (LoS) distance from the sensor to an occluding object; it returns data in cm. The Bread Proximity module is built using the Maxbotix LV-MaxSonar-EZ0 sensor. It has a operating range from 16cm to 645cm to allow for a wide range of distance measurement applications. The MaxBotix EZ0 sensor has a wide and highly-sensitive beam angle making it well suited in applications where high sensitivity, wide beam, or people detection are required. It has a resolution of 2.54cm and a max sample rate of 20Hz. The proximity sensor communicates to the BreadBoard using PWM (Pulse-Width Modulation). The Nano-B is a small form factor Bluetooth shield for quickly building, testing, and iterating on Internet of Things sensor projects. 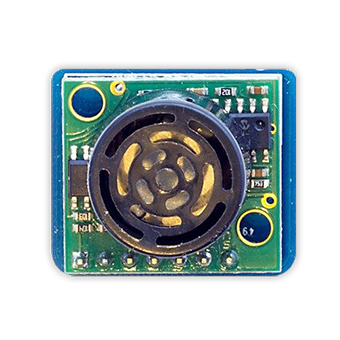 The sleek and unobtrusive Nano-B is ideal for building distributed sensor networks. The Nano-B is the smallest member of the Bread B-Line prototyping family and is compatible with all of the Bread Modules included in the Mega kit. This pack includes the Nano-B shield as well as the Nano baseboard. The Nano-B board can be programmed through the Breadware online platform, or with the Arduino IDE. Developing with the Breadware Platform allows for extremely fast and robust development of IoT prototypes. 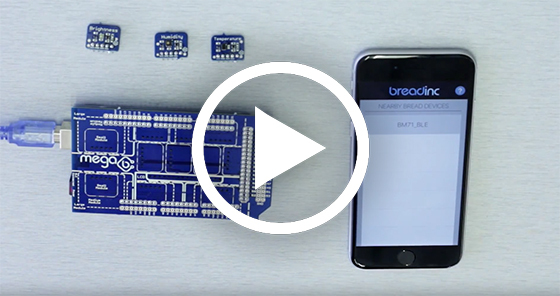 The Breadware Platform allows for firmware development, mobile app development, and web dashboard development all from one central and easy-to-use tool. With the Breadware platform you will be able to leverage design templates, write device firmware using our “hardware object-oriented programming language” (of if/then generator for those learning the c-coding language), build test mobile applications web dashboards using WYSIWYG editors, and utilize webhooks to stream data to anyplace on the web. The Nano-B has preserved all of the functionality of an Arduino Nano. 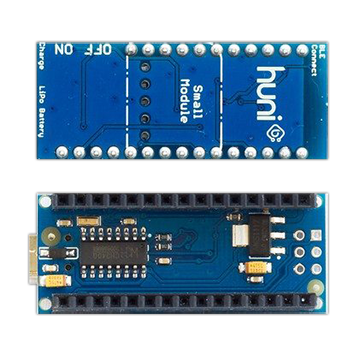 This means that for those comfortable with the Arduino environment, the Nano-B can be programmed directly from the Arduino IDE. Additionally all of the functionality and GPIOs of the base Arduino Nano are persevered giving you the capability to integrate 3rd party modules or you own designs with the Nano-B. The Bread™LCD module. Suitable for creating interactive character and number displays to a project. 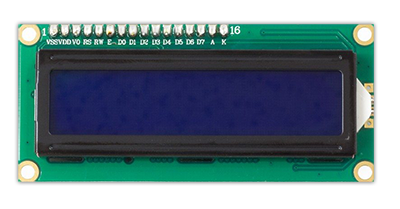 The Bread™LCD module is a 16×2 alphanumeric display. The Liquid Crystal Display screen is has a dark background with colored numbers. The 16 pin LCD module is manufactured by uxcell and is controlled via a parallel wire interface. The driver for the Bread™LCD communication is handled by the Breadware IDE allowing for easy device integration with the LCD module. Enclosed AC/DC Power Relay with Protection & De-Bounce. Screw Terminals. 120V Trigger Input. Allows for control of high power applications with the Mega B and Nano B Boards. Safe and easy to install. 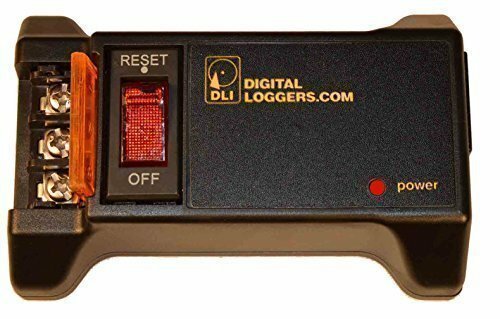 Controls any AC or DC device. Durable high current relay for long life and reliable switching. De-bounce circuit for safety. 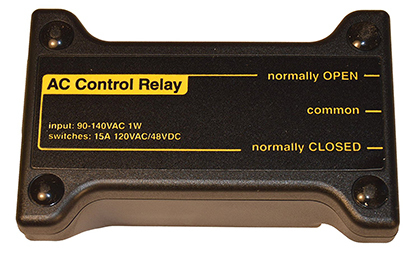 Dry contact relay output - connect to any voltage circuit. Thermal switch and circuit breaker add safety, limiting current to 15 Amps. I have just created the GroupGet for Mega-B Development Kit!